Tomorrow, at 11:30 a.m. in Houston TX, Nasa will tell us about the 'Mars mystery solved' (see the announcement here: https://www.nasa.gov/press-release/nasa-to-announce-mars-mystery-solved ) and above is the chart of that moment. I find it interesting that the symbol of things mysterious (Neptune) is on the meridian and opposite Mars on that day, time and place. That is why I posted this chart. Also Saturn (in this situation for Science) is on the Ascendant. Are you as curious as I am? Astrothème provides this chart of Hungary's PM Viktor Orbán, PM of Hungary, for 14.00 hours on May 31, 1963. 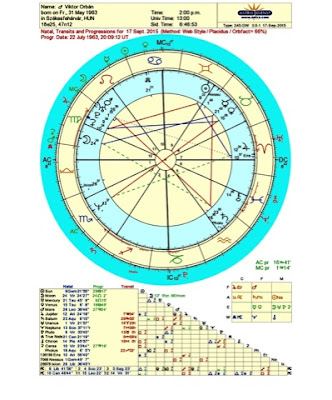 Here you his chart with transits and progressions. They are not easy. 2. With Transit Saturn trine Progressed Sun there is also stability now, continuity and self respect. This won't last for long. Saturn moves, like the refugees do. 3. Transit Saturn will be square his MC soon, if Astrothème is right about his hour of birth. Transits of Saturn are hard. Doesn't this show his present position? Some consider him as the goal-keeper of Europe. Others see him as a rebel against Europe, modern democracy and Merkel's policy. They picture him like a modern Hitler and then his fans come to show their support. But in these hectic times one thing is certain: there is criticism. And that is so Saturn, just like blockades, borders and restrictions. The combination of Uranus and Saturn issues the theme of breaking free (or not). You can see all of what is going on in that chart. For a view on Orbán, today, see: http://www.cbc.ca/news/world/hungary-s-viktor-orban-the-cunning-leader-who-would-keep-refugees-out-of-europe-1.3230749 and think of transit Saturn (criticism all around). Neptune was in Pisces in the days of the Migration (4th century) and in days of revolution. Uranus-Pluto stresses nations and creates a lot of unrest throughout the ages. Two important factors contributed to the present situation and it will not end untill Saturn is conjunct Uranus (a new order). The chart of Europe and Hungary will show what's next. Transit Saturn is on the Ascendant, Chiron is on IC and transit Pluto is square progressed MC, inconjunct progressed Descendant. In other words: trouble. Also, the progressed Sun and Moon are getting closer and closer to a square with Neptune. Such a square means confusion and sometimes decay. Saturn will be trine the natal Sun in November, maybe creating a more stabile situation, though the stress and pressure continues (Pluto still square Progressed MC). 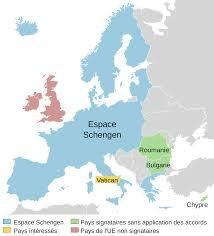 Isn't it amazing that Saturn is opposition MC, Pluto on the Ascendant and Chiron on MC when Schengen became effective? The 'corner stones' of the chart (Saturn, Pluto and Chiron) are in aspect with the angles again. Transits and progression with Saturn, Pluto or Chiron happen to be very important because they are important in the natal chart, especially Saturn, because Saturn also rises before the Sun. This all marks an important period in 'Schengen's life'. Usually they don't mean easy times. It is rebel time! Time for the rebels! No water:This calls for looking for emotions and the feeling to ‘belong’. This person is sometimes sentimental, other times without much empathy. There isn’t much ‘control’ of sentiments. He is ‘all air’, talkative, communicative and reasoning. That is what he does best. As his hour of birth is a big question mark, I can’t see if the Moon or Mars is the first to rise before the Sun on the day of his birth. The Moon would indicate involvement, the party-member. Mars would be for the activist. And the conjunction rising before the Sun would make him long for action. Now we have a communicative person with a desire to ‘belong’ to a family or party somehow, anyhow, and with a need for action. The Moon in Taurus explains the Marxism (Taurus focuses on material things), the Gemini Sun makes him communicate about it. 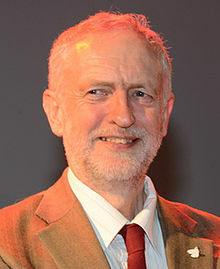 Now Jeremy Corbyn has an astro-Twin, Scottish Mrs McGuire, also Labour party member, born on the same day and in the same year. She wanted to be able to speak freely on the subject of disabilities. Unlike Mr. Corbyn, she is an extreme loyalist (!). So what position in the natal chart could show the tendency to vote against the party’s wishes? Uranus (controversy) or Eris (discord) must be important. As he is a controversial person, elected on a ‘Sun inconjunct Uranus-day’ (a day with a enormous surprise) and because Uranus doesn’t make any aspects with Sun, Moon, Mercury, Venus or Mars (surprisingly) I suppose that Uranus has a corner position in the chart (either on the horizon or on the meridian). And the party communicator…the journalist, too, are in the chart, but where is the leader in the chart? Warning: what follows is all speculation! - Moon-MC quindecile transit Uranus for the emotional excitement because of an unbalancing surprise. Doesn’t sound like a victory at all… except for the Venus-Jupiter joy (and he married in 2015). It takes a time of birth to see if the Moon, MC and Ascendant mirror yesterday's election. On the day of the next General Election in 2020, May 7… does his chart show a winner? Jupiter will be quindecile the progressed Sun (strong focus or obsession with success) before May 7, while transit Pholus inconjunct the Sun seems to indicate that he shot his own foot (a turning point in life with a loss involved – maybe just lost life style). That doesn’t offer much insight, does it? Perhaps it helps you to know that while the natal Moon is in bounds (20th degree) his Progressed Moon is Out of Bounds and on top level in 2020, but about to decline and going down in May. His best years are coming, still. But they will be over in/after 2020. Will David Cameron be his opponent then? Let’s see about David Cameron’s positions on May 7, 2020. Predicting is difficult, especially when it is about the futureJ. But Saturn inconjunct MC is pretty bad in election time. However, times are changing all the time. Maybe in 2020 both mr. Corbyn and mr. Cameron have left the stages for other reasons. *) Gemini is a double bodied sign and on the 7th house cusp this sign might signal more than 1 marriage. Uranus is a disruptive symbol that doesn't stand for continuity in the house of relationships. He married 3 times, and 2 times with someone not born in the UK. Now my chart will be up, when my dog's chart will be down, exactly in the summer of 2016, when I consider to make a trip to Eastern Europe. 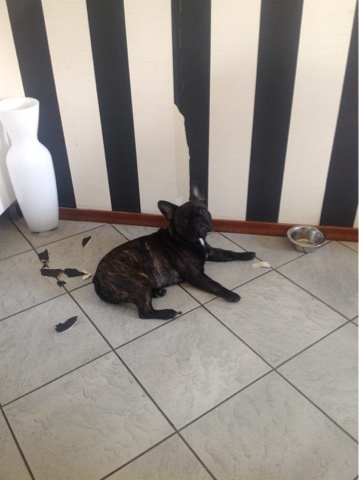 As it will be hot there and there will be many excursions to palaces and city centers, it will be better for the dog and us to leave the dog behind, in a pension with only Frenchies, in the hands of a nice lady. I could think of it as a sort of a vacation for the dog, but I know that while my chart has Jupiter-P Venus during the trip, hers has transit Saturn square Sun and Progressed Sun. And that is an uneasy thought. Especially since the latest example of Saturn with Sun and Progressed Sun was that of a well known singer in my country who ended in hospital on a Greek island, after being hit by a car, while walking on the street. So, maybe that explains my concern. Usually there is some correspondence between charts of partners and if not, it is a sign of not being in line, at least. Imagine that they don't tell me how sad my dog is (just to keep me happy) and that I'd never know if I hadn't studied astrology... Or am I 'tripping' the bad way? No way to look away and not consider the charts involved in the tragedy of refugees in Europe today...What is in the charts? You'll see Neptune in the charts of Germany and Merkel, while Uranus and Pluto hit the chart of January 1, 1925 (Syria). And coincidence, or not: Neptune is the planet of 'no borders, no limits' and Uranus-Pluto means intense tension and dramatic change. Sun, Progressed Sun, Ascendant, Progressed Midheaven and MC all have a position between the 10th and 16th degree of the Capital Signs. Those are exactly the degrees that were and will be hit by Uranus and Pluto. These two planets were 90 degrees apart (square) since 2011 and symbolized the unrest, extreme tension and dramatic change in the world right now. Also, the Progressed Sun of Syria's chart will be inconjunct Saturn within a year from now. This is a signal of coming decline. Right now there is migration from Syria to Europe. The people wants to move to Germany, where they expect to get a better life than in any of the countries that they walked or travelled through on the way to the country of Mrs Merkel, who recently sort of invited the refugees but she forgot to bring them 'home'. Progressed Ascendant near Mercury (planet of transportation) perhaps illustrates the situation. Transit Pluto opposition the Progressed Moon of the chart above reflects intense emotions and the people in problems, while transit Saturn inconjunct progressed Mercury seems completely in line with the difficult voyage with so many lost lives and what people left behind when they said goodbye to there home land. Considering the chart above, it doesn't look like there will be a solution for Syria, not soon enough to stop the migration. Now how about Germany? The chart of Germany (United Germany, October 3, 1990, Berlin, zero hours) has transit Neptune in Pisces inconjunct the natal Sun in Libra. That is exactly the kind of aspect that makes it hard to deal with all the Neptunic things such as refugees, the sea, idealism, beliefs and the media. This aspect demands clarity, openness and open eyes when there is little balance and too much confusion. It is har to do. The chart of the leader of the nation is in line with that. 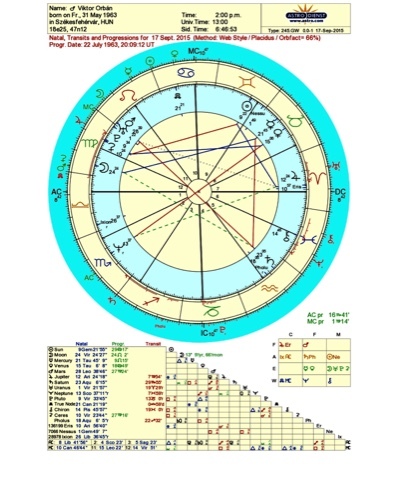 In her natal chart Neptune is on the MC and square the Sun (just like in the chart of Obama) to show you that certain ideals, ideologies and beliefs will be of utmost importance in her life and connected to her career. Now Mrs Merkel's name sounds all over the Budapest' railway station. Being an idol that way, may not have been her purpose. It is a complex situation and apparently, the political leaders can't deal with it. So the people who lost their homes and didn't see any future, made the choice to start walking to an unknown but peaceful future and to demand access to the nation that seems to have the best economic and cultural cards. Uranus-Pluto and Neptune in Pisces, symbols of revolution and change, did there job. All that astrologers can do, is signal the aspects and point at the indications of dramatic change. There is no astrological solution, but there is some hope.